Considering initial ideas and pre-production started with a 3,500 panel storyboard, it’s no surprise if you break it down that Fury Road is like a graphic novel come to life. This is Ozploitation on a $150 million budget. The most robust side of the Australian film industry people seem to always forget is the genre movie, and Miller has not compromised his vision or done anything but deliver what everyone (i.e. the target audience) wanted to see. Plus, Fury Road does indeed feel very much an Australian film despite the two leads not being born of this country or asked to employ an (ocker) accent. The initial plan to shoot most of it Down Under didn’t quite pan out, but one can’t deny this is a product of the sunburnt country. The scale of the film is mind-boggling. The most of any Mad Max film to date. It could have only been made in a post-2000 world, but atypically, it has been done with a very old school sensibility. George Miller knows what he wants. Fury Road is his (and comic writer/artist Brendan McCarthy) vision come completely to life. That vision is bizarre, brutal and chaotic. Like a crazy metallic Western. The logistical nightmare of achieving it is unthinkable. No wonder it took almost 12 years (from concept) to get finished. 30 years ago, making this movie would have literally killed people; such is the level of stunt work involved. 80% of what we see on-screen is practical (see: real) effects and stunts. CGI was mainly limited to backdrops, removal of visible obstructions/equipment and some weather effects, but overall, this was classic action filmmaking that would make John Frankenheimer or Walter Hill proud. Some moments will simply leave you shaking your head whilst making the i-Gen cry foul when you tell them it was done ‘for real’. Don’t they realise Miller and Australia revolutionised this kind of thing? Not content with anything less, the enigmatic director has for the second time shown Hollywood how to create awe-inspiring action. As far as blockbusters go, the glut of two dudes with superpowers going at it in front of a green screen has received a breath of fresh air. What green screen? All these cars are real and they are about as outrageous as we could have hoped. The first, most prominent thing about Fury Road is that it is about women. Sure, there are plenty of blokes around, but the film asserts itself with a feminist agenda from practically the first moment we meet the character of Furiosa. She is born out of that hidden-in-plain-sight notion amidst all the manly road carnage. Her journey is primarily what separates it from anything in the action genre today. Her character is a catalyst and the “hero” in a world existing by way of testosterone; shaven head and mechanical arm an all. Towering South African beauty, Charlize Theron seems like the perfect choice as she has proven herself apt at the physical and transformative from previous roles. As Imperator she is tasked to haul The War Rig; an 18 wheeler not dissimilar to the tanker used in TRW, and is commanded on her way into our wasteland by the free world’s tyrant, Immortan Joe (Hugh Keays-Byrne) as he oversees the Citadel. Furiosa; the warrior; the survivor; has another plan however. One that involves Joe’s fives wives (aka breeders) and she sets herself off his course causing Joe and his army of War Boys to see red and the pursuit begins. Their blind faith in their god-like leader propels them every step of the way. Of course, our film does still begin with Max and establishes that he is – only ever is – a drifter, haunted by flashbacks from his past and now knows only one instinct of being: survival. Captured and used as a blood bag for War Boy Nux, his initial goal is freedom. In this incarnation, Max, as handled by British thespian Tom Hardy, plays up the crazy a lot more. Face twitches and delirious actions are all there and more exaggerated than what Gibson did with the role. He felt very Bruce Campbell-as-Ash in this sense in some moments (this is a good thing), but he is also hard as a coffin nail and won’t hesitate to kill. Even some of his bad-arsery is shown off-screen as Miller knows his rep simply speaks for itself. Which is why letting Furiosa control the narrative works so well too. When the action gets going however, Furiosa and Max become the one-two punch needed to complement each other’s drive for survival. Hardy shows that you don’t have to be Mel Gibson to be Max, and even though his grizzled tough voice is a bit much sometimes there’s no denying he has captured the quintessence of character well and should take the role into more films if they happen. Nux, played by Nicholas Hoult is brought to forefront for the War Boys and the young actor transforms himself into one of the weirdly intense suicidal followers excellently. It’s a passionate, integral performance. Pleasingly overall, most of the antagonists are a disturbing, bizarre, funny and detailed bunch. Something like Thunderdome meets Dune would best describe most of their character designs. The army of War Boys are not all a nameless, faceless bunch of stunt men and extras either. Miller has let personalities prosper and each one revealed has a decent level of intention to detail, whether it’s five scenes or just five lines of dialogue. Even the flame throwing guitar freak atop The Doof Wagon doesn’t feel artless or hollow. He’s right where he belongs in this odd mythology and despite backstories for everyone being virtually non-existent, we get it. In this wasteland, every new encounter seems to fit just right. Their names prove to be as creative as their design too: The People Eater, Rictus Erectus, The Organic Mechanic and it goes on…all played by some very familiar Australian actors. The impressive detail in every aspect to Miller’s world and its inhabitants makes becoming immersed unavoidable while the adrenaline from the chase keeps you wide-eyed throughout the quick two hour pace. Come awards season, Fury Road could stand to sweep every technical prize going and just given the monumental task of overseeing and constructing the vision, it’s not too far-fetched to say Miller deserves some gongs for directing. Editing, sound design and cinematography should all be locked in because you won’t see anything as feverish or starkly beautiful than the visual side of this movie in the action genre. Coming out of retirement for Miller was cinematography John Seale; an Australian icon behind the lens. It shows. How hard it must be to create a post-apocalyptic environment that we haven’t seen a thousand times before, but Seale, as well as help with enhanced CGI backdrops and weather effects has achieved a wholly fresh look, both at night and day. The sandstorm glimpsed in the trailer may not be “real”, but is still a jaw dropping sight to behold early in the film. The cutting amounts to nothing short of amazing. Done with a Guy Ritchie/Edgar Wright type flair, it still doesn’t go over the top and seem like a video game, but keeps the action coherent, aggressive and quick. Frame rates chop and change but don’t annoy the audience. The structure is essentially just one long chase, but is paced in just the right way to catch your breath and begin again. The poignancy and emotion scenes bring a much needed break and exposition. For some, Fury Road may be one car chase too many, but for action fans and those who don’t want the film to end, it executes almost too well. The score by Tom Holkenborg is a nice mixture of modern and traditional and fits the material quite well but more impressively are the moments of silence placed and utilized strikingly. Hints of Brian May’s brooding emotional strings from The Road Warrior are acknowledged with Max’s own running theme. Though it was clear Miller was not interested in revisiting anything too similar. Homages or nods are one thing (and there are plenty towards the second film), but this is a new adventure after all; for all the talk of prequel, sequel or reboot from the usually inane internet, it’s obvious from the first five minutes none of these concepts were Miller’s intention and his goal, of simply making another chapter of a franchise he knows better than anyone, is realised through the loose aura that exists to associate all the films. All of them can be watched without any connection to the other in all honesty. To just call this The Road Warrior turned up to 11, wouldn’t be too wide of the mark either however. For all the exhilaration on display, the off kilter but very funny humour throughout and just plain wonderful weirdness (which is considerable for a mainstream blockbuster) in Fury Road it stumbles in other ways. But only just. The first act of a fairly linear narrative is somewhat clunky as anticipation to get to the action gets in the way of what little prologue is on offer as Miller unsurprisingly gives us a mere handful of sentences on a voice over to set the table. That IS the way it should be for this film though, but it can alienate your audience somewhat if they have little to invest in besides the obvious good vs bad. For some, Fury Road will be the only Mad Max film they have ever seen and ambiguousness doesn’t always go down well with casual movie watchers. As the film rolls along of course, this is tempered as motivations behind our characters come to the forefront. 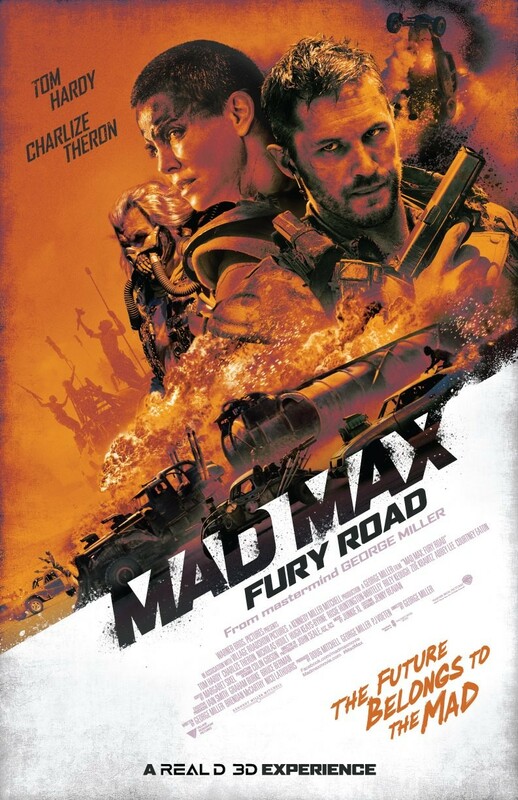 By the nature of the script and not the actors some emotion – mainly exhibited by Furiosa and Nux – fails to truly dig deep in some scenes, but it isn’t enough to distract or cause eye rolling; Fury Road takes itself very seriously and what is written is above what you’d usually expect from something promoted as an action film. It won’t be everyone’s cup of tea, but ultimately sitting on the fence about seeing Mad Max Fury Road is futile. This is a must experience film. Chances of seeing anything like it again anytime soon are pretty slim. Nobody has the vision, skill or the brass to take a Hollywood blockbuster sized budget and not compromise like George Miller has here, and it will sit deservedly alongside the first two Mad Max entries in the years to come. Though we had to be patient for the delivery, he has raised the bar for the genre, for fans of the series and taken us on an evocation of when movies made you feel something while you are watching them again, with real exuberance, adrenalin and excitement. This thing starts rolling and doesn’t stop. An ode to cinema that contains some nice tributes of its own to such an obscurity like The Cars That Ate Paris or the Jim Henson classic, The Dark Crystal. It’s a violent celebration to be sure, but this is why we go to the movies and no Hollywood blockbuster in recent memory can claim to deliver the same feeling with such authenticity. It’s a shot in the arm. See it. Feel the twisted metal and embrace it. This entry was posted in Film: New/Cinema Releases and tagged Action film, Australian Film, Blockbuster, Charlize Theron, Fury Road, George Miller, Junkie XL, Mad Max, Nicholas Hoult, Post-Apocalyptic, The Road Warrior, Tom Hardy. Bookmark the permalink. You’re best yet, old timer.